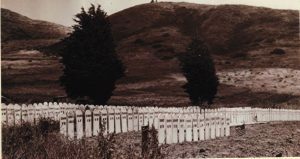 The Town of Colma is home to seventeen cemeteries, including pet cemetery. If you are searching for a deceased family member or friend, and you think they are resting in Colma, you can reach out to the cemeteries listed below and they can search their records for your family member or friend. You can also use the interactive map located at the bottom of the page to find directions to each cemetery. Also listed below is a list of our famous underground residents and direction to the final resting place of Wyatt Earp. GOLDEN HILLS MEMORIAL PARK, INC. The Colma Historical Association can provide you with directions to approximate burial locations, Tuesday – Sunday, 10:00am-3:00pm.